Toronto Mayor John Tory was on hand Tuesday morning for the launch of YYZ Live, a new daily concert series greeting international arrivals at Pearson International Airport’s Terminal 1. In celebration of Canada 150, the event will run from June 26 to September 15, with 150 performances by 75 emerging artists from Toronto’s music scene. Pearson is Canada’s largest airport, seeing more than 44 million passengers travel through the airport in 2016. As identified in Music Canada’s The Mastering Of A Music City report, airports in cities like Austin, Melbourne, and Seattle have already successfully hosted music performances. In Seattle, the trial program generated USD$259,000 for the artists from wages, tips and merchandise. The program’s success guaranteed its continuation for another three years, and helped permit the opening of a Sub Pop record store in the airport. Mayor Tory concluded his remarks by reinstating his commitment to the future success of music in Toronto, noting the success of its artists and the arts sector help the “soul of the city” and attract more talented people to Toronto. Mayor Tory and Councillor Josh Colle, Chair of the Toronto Music Advisory Council, also acknowledged the efforts of Councillor John Filion, who was absent from Tuesday’s announcement, but instrumental in making YYZ Live a reality. There will be two opportunities daily to catch the performances, with a 7pm show at the YYZ Live Stage (Terminal 1, International Arrivals), and an 8pm show at the YYZ Live Acoustic Stage (Terminal Link train platform). For artists interested in performing, applications are still being accepted by submitting this application to perform@toronto.ca. 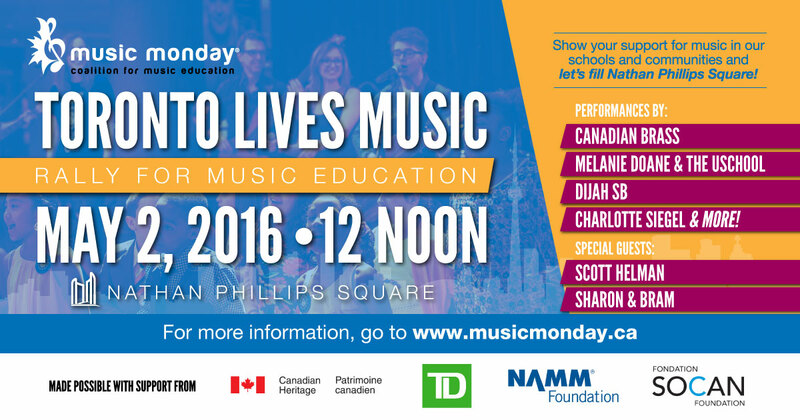 Music Canada, in partnership with TD Bank Group, is proud to return as sponsor of City Hall Live, formerly known as Live From City Hall. The program will expand this year to include new collaborations with local venues, events, presenters and musicians. This past weekend, City Hall Live presented eight artists performing at 159 Manning Ave as part of Doors Open Toronto. Today, City Hall Live is presenting performances by Toronto artists Ammoye and Charmie as part of the pre-Lulaworld 2017 festivities at Lulu Lounge following a 6:30pm panel discussion on diversity and live music in the media. More collaborations will be announced in the coming weeks. 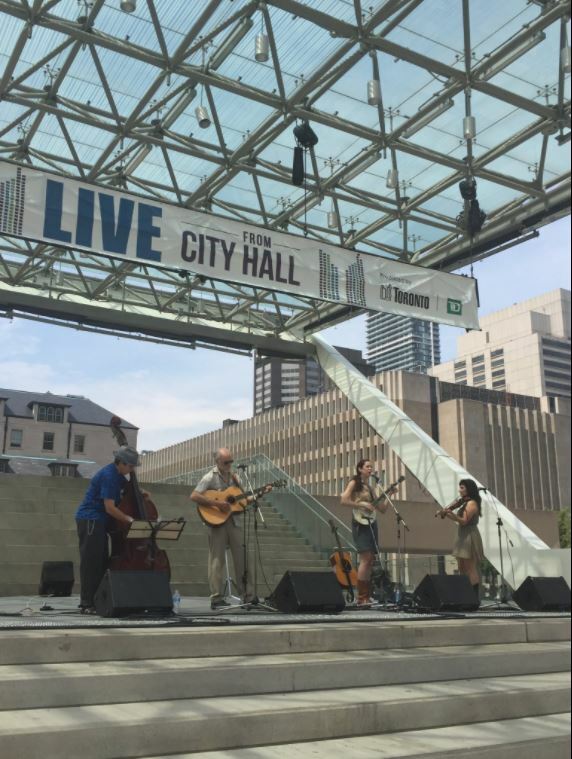 Lunchtime concerts under the City Hall Live banner will return to Nathan Phillips Square this summer, happening every Wednesday from 12:30-1:30pm (July 19 – August 30). City Hall Live will also bring a larger focus this year on panel discussions and other learning opportunities for the music community. 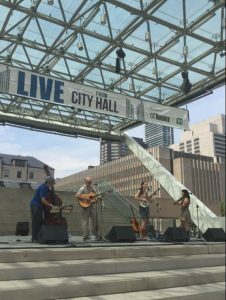 “City Hall Live provides new opportunities for Toronto musicians and is one of many City initiatives aimed at making Toronto a more music and musician friendly city,” said Councillor Josh Colle, Chair of the Toronto Music Advisory Council. Artists can submit applications to perform at City Hall Live and other events, as well as submit music for the City’s Music 311 playlist at toronto.ca/music. More information on 2017 performances and panels will be announced soon at toronto.ca/music. The summit was based on Music Canada’s 2015 report of the same name, which set out a roadmap for cities to become Music Cities—by supporting the music sector and realizing the often-huge economic dividends from the creation, performance, and reception of music. 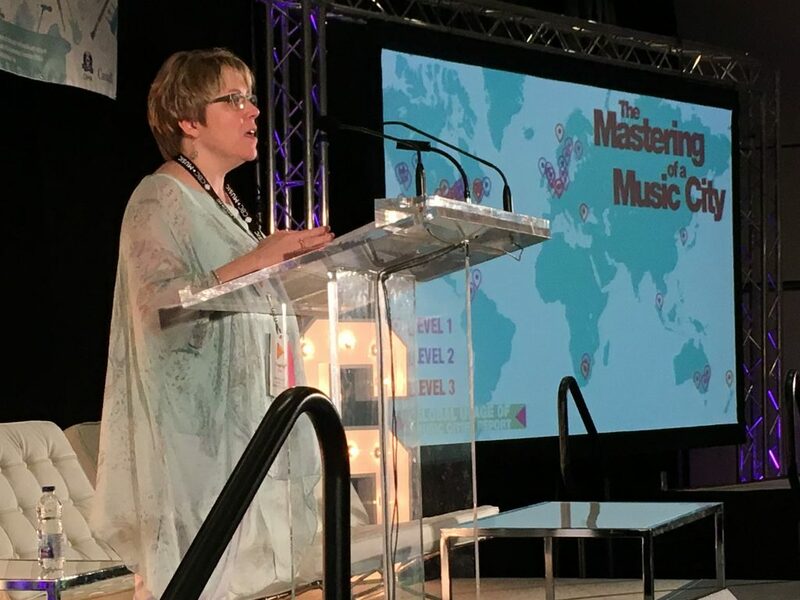 The Mastering of a Music City Summit was curated and hosted by Music Canada Executive Vice President Amy Terrill. In its second year, the event was a remarkable success, attended by a cross section of people from all over the world—from Canada and the United States to Poland, the United Kingdom, France, Italy, Jamaica, Columbia, and more. While the summit was attended in person by nearly 200 entrepreneurs, city planners, music industry executives, artists, and musicians, over 5,000 people from around the world tuned in to watch the livestream of the event. One of the many highlights of the day was an opening address from Toronto Mayor John Tory which functioned as a ‘state of the music industry’ for the Music City. The mayor highlighted the strength of the music scene and the progress the city has made so far, including: creating the music in parks permit, changes to musician loading/unloading zones, the mayor’s evening for the arts, and attaching local music to city services like 311. In his speech, the mayor articulated his vision and goals for the city’s music industry in 2017. The city will aim to lead more live music events, including showcases, abroad and at home, and will create over 200 city-led opportunities for artists over the next year. The city will make music part of the planning process at city hall by putting a motion to council that would notify new developments of existing nearby music venues. The mayor will also classify music as an eligible activity in the city’s employment lands. The city will support music tourism by bringing local musicians to the city’s airports, and programming a Winterlicious-style music event to boost activity in the off-season. Helen Marcou, owner of Bakehouse Studio in Melbourne, Australia, delivered the opening keynote presentation on The Role of Advocates: A Story of Successfully Fighting for Your Music City. When stringent and high cost regulations forced a storied punk rock venue in Melbourne to close, and another 126 venues to reduce their programming, Marcou began a movement called Save Live Australia’s Music, or SLAM. The campaign had a simple but effective message, “don’t kill live music,” was inclusive and non-partisan, and brought over 20,000 supporters out to the steps of the legislature. When the campaign was over, laws were amended and a permanent voice for the music community created in the form of a music advisory body. Marcou continues to advocate for live music, but spoke about her more recent efforts to combat sexual assault and harassment of women in live music venues and at music festivals. When Marcou penned a letter to government calling for action, the state created a taskforce to combat sexual harassment at live music venues. The Music City Leaders Panel asked key questions of elected officials who have identified music as a key strategy or economic sector in their cities. Panelists included Karl Dean, former mayor of Nashville; John Tory, Mayor of Toronto; Filippo del Corno, Assessore alla Cultura, City of Milan; Maria Claudia Lopez Sorzano, Secretary of Culture, Recreation and Sports, City of Bogota; Delroy Williams, Mayor of Kingston, Jamaica; and Manon Gauthier, Member of the City of Montreal Executive Committee, City of Montreal. The panelists gave critical advice to would-be Music City advocates, and industry cooperation and collaboration emerged as a key theme. Tory said that advocates must focus on the issue, and speak with one voice if they want to be heard. This sentiment was echoed by Gauthier and del Corno. Karl Dean, former mayor of Nashville, remarked upon his work establishing affordable housing specifically for artists. Music Cities, according to Dean, are strong and thrive because of the creative people that they attract. He pointed to music education and raising creative audiences and creative people as key principles. Following a presentation on the need for restoration and protection of Detroit’s music venues, moderator Vel Omazic, Executive Director of Canada’s Music Incubator, led the Music Ecosystem Panel. 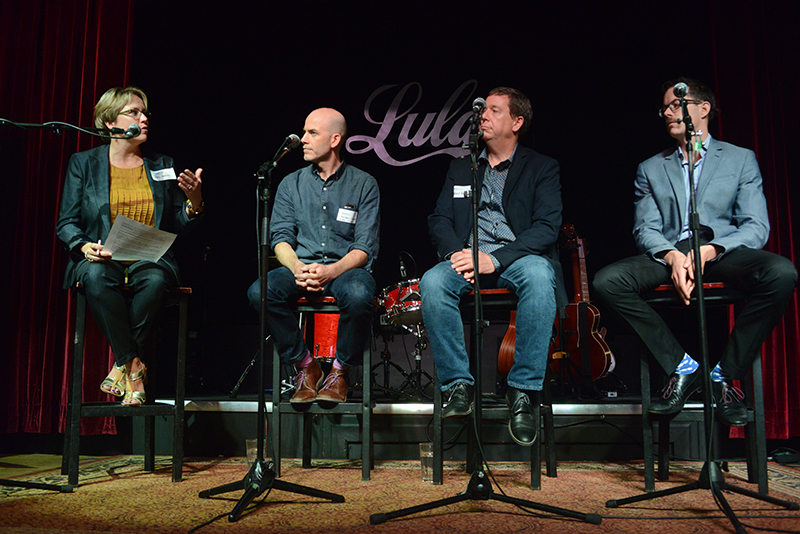 The panel discussed how cities should go about identifying and solving gaps in their Music City ecosystems. Omazic was joined by Andreas Kalogiannides, a business entertainment lawyer and co-chair of the Toronto Music Advisory Council (TMAC); Christina Fitzgerald, CIND-FM (Indie 88); Didier Zerath, Artist Mgmt & Music Industry Consultant; Dino Lupelli, CEO of Linecheck Music Meeting & Festival; and Jesse Elliot, Director of The Music District. One of the key themes that emerged from this panel was the importance of the grassroots music community driving change. According to Elliot, community engagement for The Music District—a Fort Collins music hub for musicians and music related businesses—lasted over one and a half years and was a key reason for the success of the program. Andreas spoke to the results of the widely responded to survey that TMAC used to identify issues when formulating the Toronto Music Strategy. The survey, which was answered by over 6,000 individuals, emphasized the city’s need for livability and affordability for its creative class and a need for accessible rehearsal and performance spaces. The Music Ecosystem Panel was followed by a series of presentations on the value of the UNESCO Cities of Music. The presentations were delivered by representatives of member cities, Kingston, Jamaica, Bogota, Columbia, and Katowice, Poland. The panel talked about how music can be a powerful motivator for travel, especially when associated with powerful and memorable experiences. Rollo spoke to the opportunities that music provides. Artists and musicians are able to create experiences for their fans that no other sector can provide, and it can be a significant draw for visitors. Furthermore, music tourists spend significantly more on travel and associated expenses than other types of tourists, according to Beukema’s experience. A presentation from Molly Neuman, Head of Music at Kickstarter, followed the panel. Neuman spoke to the crowd-funding company’s desire to support the creative independence of artists and music communities. The conference closed with a panel moderated by Toronto City Councillor Josh Colle which asked panelists to investigate the competition for space between developers and music venues—an issue that developing cities around the world, including Toronto, are dealing with. The panel included members of the music industry, city officials, and a representative of a US development company. Shain Shapiro, Managing Director of Sound Diplomacy, and Jocelyn Kane, Executive Director of San Francisco’s Entertainment Commission, told the conference about their cities’ experiences with the ‘Agent of Change’ policy. In San Francisco, this means that new developments must do acoustic tests and implement sound mitigation if they are built within 300 ft. of a music venue. The Entertainment Commission also ensures that new tenants cannot sue nearby venues for noise issues. Shapiro put forward that many developers want to support music and that the industry and government’s role is to facilitate that. As new developments in London are mandated to have cultural space components, Shapiro’s organization has created guides for developers on how to make those components music-related. Watch the live recording of the How to Work with the Development Community panel (part 1 and part 2). 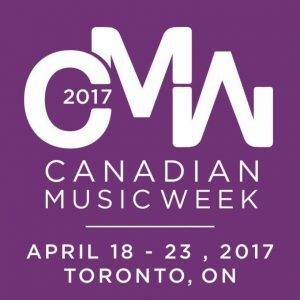 Once again, global city planners and the music industry will take part in Music Canada’s and Canadian Music Week’s international creative-economy summit “The Mastering of a Music City.” The day-long summit will take place during Canadian Music Week on Friday, April 21, 2017. This will be the second year of the summit which last year brought close to 200 entrepreneurs, industry executives, tourism experts, artists, and musicians from all over the world together to talk about Music Cities—the shared realization that cities across the globe enjoy an often-huge economic dividend from the creation, performance, and reception of music. The summit will begin with opening remarks from Neill Dixon, President of Canadian Music Week, and Amy Terrill, EVP, Music Canada, and author of “The Mastering of a Music City” report, and Mayor of Toronto John Tory. Helen Marcou, owner of Bakehouse Studio in Melbourne Australia, will deliver the opening keynote on The Role of Advocates: A Story of Successfully Fighting for Your Music City. When an iconic Melbourne venue was threatened with closure, Helen started a movement called Save Live Australia’s Music, or SLAM. Before she was done, 20,000 had marched on the steps of the legislature, laws were amended, and a permanent voice for music was created. Helen continues to be one of Melbourne’s strongest music advocates. Helen will share her story of fighting for her Music City. A keynote presentation by Molly Neuman, Head of Music at Kickstarter How to Prevent Monoculture from Killing Our Music Cities. Neuman will speak to the future of culture sustainability. A presentation and panel session on UNESCO Cities of Music that asks whether it is time for a North American member. The Music City Leaders Panel will ask key questions of elected officials who have identified music as a key strategy or economic sector in their cities. Panelists include Karl Dean, former mayor of Nashville; John Tory, Mayor of Toronto; Filippo del Corno, Assessore alla Cultura, City of Milan; Maria Claudia Lopez Sorzano, Secretary of Culture, Recreation and Sports, City of Bogota; and Manon Gauthier, Member of the City of Montreal Executive Committee, City of Montreal. The Music Ecosystem Panel will discuss how to identify gaps in a city’s music ecosystem—which supports the development of artists—which gaps are critical and what to do to address them. The Music Tourism Panel will talk about how music is a powerful motivator for travel. Attendees will hear from some of the most successful properties that incorporate music into their offerings, and how it attracts music tourists. The How to Work with the Development Community panel will be moderated by Toronto City Councillor Josh Colle, and will include Shain Shapiro, Managing Director of Sound Diplomacy and Co-Founder of the Music Cities Convention. The panel will investigate the competition for space between development and cultural spaces. Individual tickets are available to the summit or you can gain access with the CMW VIP pass. Music Canada will livestream the opening remarks and the following panels: The Role of Advocates: A Story of Successfully Fighting For Your Music City, The Music City Leader’s Panel, and How To Work With The Development Community. You can watch these discussions live on Music Canada’s Facebook feed. Below is a statement jointly issued this afternoon by Toronto Mayor John Tory and Councillor Josh Colle on the City’s commitment to live music venues following recent venue closure announcements. 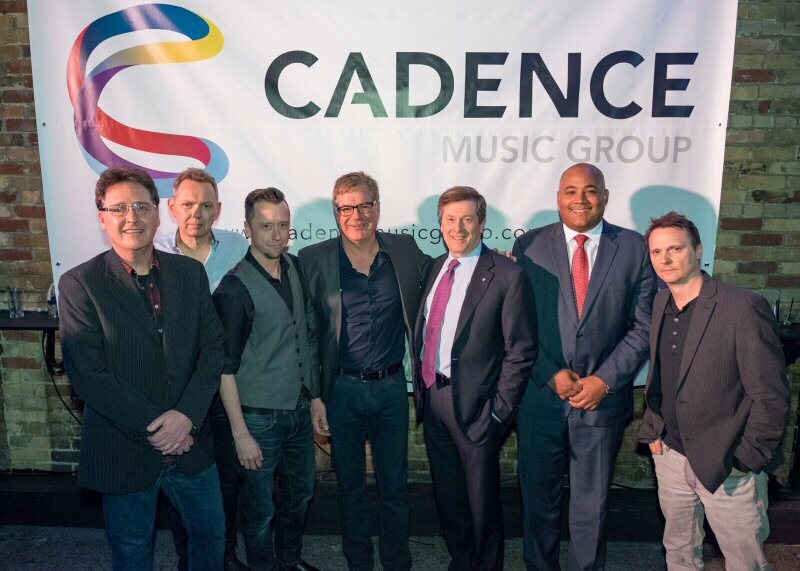 Coinciding with their 15th anniversary, leading independent music company MapleMusic has officially rebranded as Cadence Music Group. The announcement was revealed at an industry gathering Tuesday evening at Toronto’s newly renovated music venue The Velvet Underground. Among the attendees Tuesday night were the Hon. 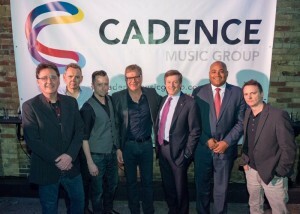 Michael Coteau, Ontario Minister of Tourism, Culture and Sport, Toronto Mayor John Tory, and a cross-section of over 250 guests from Canada’s music sector, government, and other music industry stakeholders. Music Canada was thrilled to welcome many of our members, friends, and industry partners to our 2015 Annual General Meeting, held on September 24, 2015, at the Lula Lounge in Toronto. Among the program highlights, the AGM featured a conversation with Toronto Mayor John Tory and Music Canada President & CEO Graham Henderson. Entitled ‘Toronto’s Music City – View from the Top’, the discussion centred on Toronto’s role and reputation as a Music City, and how the City, community, and local music industry can continue to foster this reputation. For more on Tory’s remarks, visit our blog. Next, Henderson delivered the Year-In-Review, which underlined the importance of collaboration and partnership within our industry. 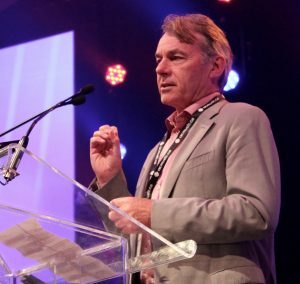 After noting the growth in Canada’s digital music market, helped by the launch of new streaming entrants in the market, Henderson highlighted the Ontario Music Fund, which was made permanent in Ontario’s most recent budget bill. “Thank you Premier Wynne and Minister Coteau for seeing the economic value in Ontario’s booming music sector,” said Henderson. The success of the Ontario Music Fund has sparked interest across the country, explained Henderson, pointing to the Fertile Ground report commissioned by the National Music Centre and completed by Music Canada last fall, which provides recommendations for leveraging the potential of Alberta’s music sector. Henderson then announced that Music Canada is undertaking a study on British Columbia to make similar recommendations to their provincial government. At the federal level, Henderson noted a major win in the budget bill with term extension for sound recordings. Noting that these recordings would otherwise fall into the public domain during the artists’ lifetime, the unprecedented success on term extension brought Canada in line with international standards. Henderson also congratulated the Unison Benevolent Fund on reaching their $1 million fundraising target this year, making the fund operational. Music Canada is proud as an organization, along with our label members, for the role we played in investing $250,000 for the fund. Henderson then recognized our matching partner, Slaight Music. Continuing on the Music Cities theme, the AGM featured a panel entitled ‘Music City Strategies from the Ground Up’ with three panelists from across Canada who shared insight to the strategies and programs they are using to grow the music sector in their home regions. Andrew Vincent, a singer-songwriter, researcher, and creative consultant from Ottawa, ON. He is the co-author of Connecting Ottawa Music, an Ontario Music Fund-supported project profiling Ottawa’s music industries that was released in Spring 2015. He is currently serving as the interim Executive Director of the newly formed Ottawa Music Industry Coalition, a not-for-profit dedicated to promoting growth in the city’s music industries. Mark Garner, Executive Director for the Downtown Yonge Business Improvement Area in downtown Toronto. Over the past decade he has increasingly focused on the revitalization and development of urban downtowns, playing an integral role in catalyzing on economics, neighbourhoods, social innovation and incubators. The DYBIA boasts a Music Strategy that looks at the deep history of music in downtown Toronto, programming His ideas and approach have been acknowledged by numerous awards and by being emulated in other communities. Thom Bennett, a professional musician/producer/recordist/instructor based in Edmonton. He performs regularly around Western Canada and beyond with a plethora of artists including A/B trio, MIXTAPE, Ann Vriend, Jesse Peters and dozens of other artists. When not maintaining his busy gigging schedule he splits his time between producing and engineering records for local artists at Sanctuary Studios, session studio work, accompaniment work, teaching and composing music. Thom has created the ELM (Edmonton Live Music) Initiative involving with the support and help of key stakeholders in government and the music industry in Edmonton. Its aim is to reinvigorate Edmonton’s live music scene through an innovative economic stimulus plan that involves the Alberta Gaming and Liquor Commission. 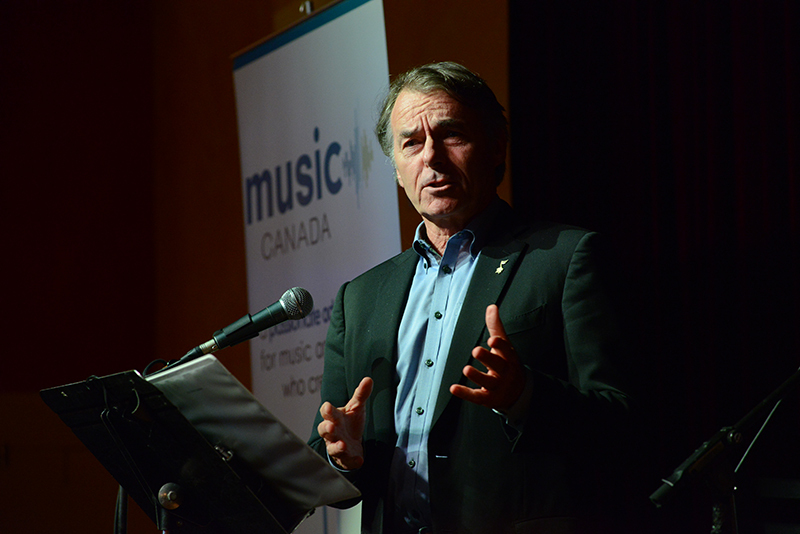 Following the panel, Henderson introduced a new tradition at the Music Canada AGM with the creation of the President’s Award, which recognizes an organization or individual outside the music industry that has had a significant impact on the music industry. The inaugural recipient of the award was Mark Garner of the Downtown Yonge BIA, which has created an action plan to stimulate music performance, creation, education and celebration in the downtown core of the city. Their music strategy builds on the rich music history in downtown Yonge in order to create an environment where music can succeed now and in the future. For more on the President’s Award, visit our blog. To close out the day, Warner Music Canada President Steve Kane introduced Modern Space, a five-piece Toronto-based band that recently signed with Warner Music Canada. 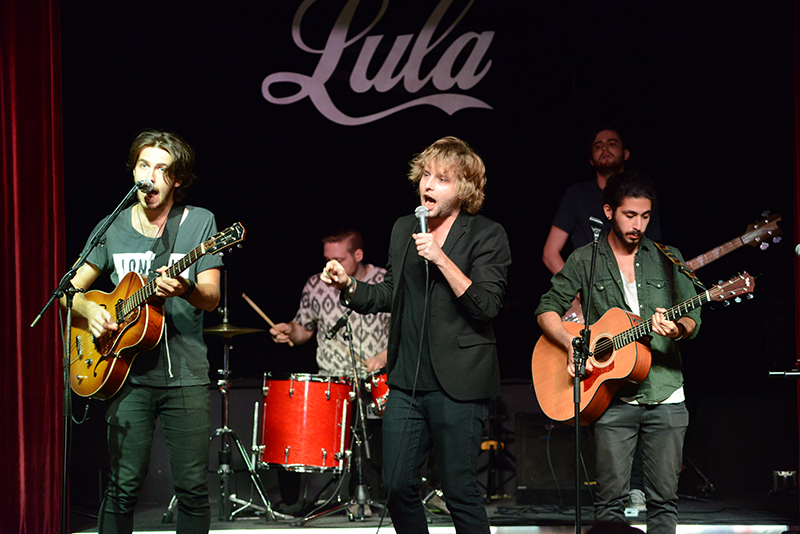 The band delivered a high energy performance of songs from their upcoming debut EP. For more photos from the Annual General Meeting, visit our photo album on Facebook. Yesterday we had the pleasure of not only coming together with our peers in the industry for the Music Canada AGM, but to host a number of wonderful speakers on the subject of Music Cities. 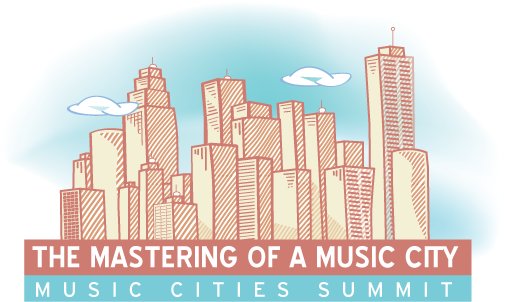 Since the release of our report The Mastering of a Music City in June 2015, we have passionately pursued this subject around the world, learning from our colleagues in more than 40 cities. 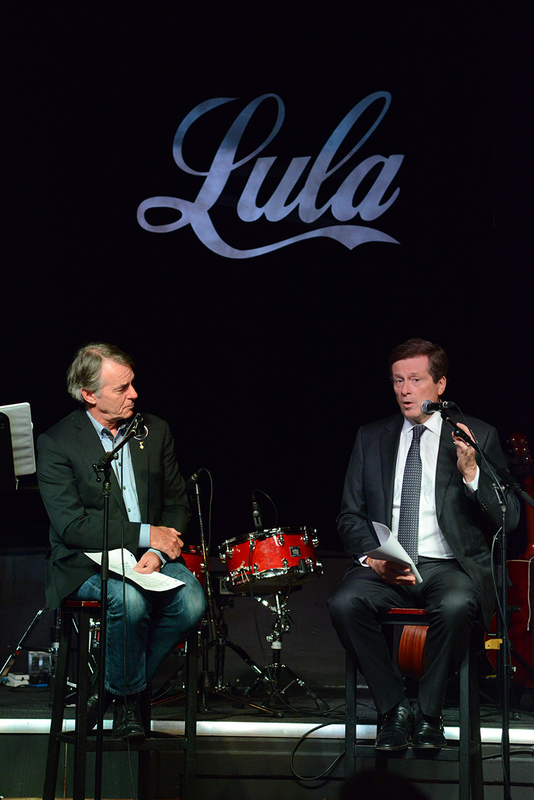 Yesterday it was especially special to talk about what Toronto is doing at home, with our own “music-friendly mayor” and champion of the music city: Mayor John Tory. In last year’s municipal election, Mayor Tory had a music platform that included tourism, enhanced live performances and festivals, and a standalone music office. Now, nine-months into his term, many of those things have become a reality in a short period of time. In a candid conversation with Music Canada President and CEO Graham Henderson, Mayor Tory spoke about the strides we’ve made so far, what’s next, and what inspires him in his vision of a music city. This is a vision he has for Toronto: seeing the same kind of support rallied around music in the same way as we have done for film for the past 30 years.